Outside Japan's Evacuation Zone, Villages In Limbo As life near the crippled Fukushima nuclear reactor complex becomes increasingly difficult, Japanese authorities are encouraging people who live outside the mandatory evacuation zone to move farther way. But some are choosing to put up with the hardships and remain in their homes. Authorities in Japan are encouraging people who live near the crippled Fukushima Dai-ichi nuclear reactor complex — even those outside the mandatory 12-mile evacuation zone — to move farther away from the plant. Life near the plant is becoming increasingly difficult, officials say, as supplies of food, fuel and potable water in the area dwindle. The town of Iitate is just outside both the mandatory evacuation zone and the 18-mile shelter-in-place zone — an area where people have been told to make efforts to stay indoors to avoid airborne hazards. Iitate is not under any order to evacuate, yet nearly half of the town's 6,000 residents have fled. While some of those people have since returned, the majority have not. Takashi Kobiashi, the chief administrator for the village, says Iitate faces numerous problems right now. There's a shortage of food, gasoline is in short supply, businesses are closed, and the radiation levels in the tap water are so high it's undrinkable. "Our big problem right now is the ongoing crisis at the nuclear plant," Kobiashi says. "There's no estimate of when the situation will be resolved, so we don't really know how to move forward." About 1,200 people from villages close to the plant originally were evacuated to Iitate, but as the radiation levels began to rise here, those evacuees were shuttled even farther inland. There's no estimate of when the situation will be resolved, so we don't really know how to move forward. On Iitate's main street, the only shop that is functioning is a 7-Eleven convenience store. It just reopened Monday, and its shelves are only about half-full. Kobiashi says that inside the 18-mile zone, things are even worse, and no stores are open. The Japanese Self-Defense Forces are using Iitate as a base from which to deal with the nuclear crisis on the coast. Helicopters and green military transport trucks ferry people in and out of the exclusion — or evacuation — zone. The top spokesman for the Japanese government this week warned residents to stay out of the area after there were reports that some people were sneaking back in to collect belongings from their homes. 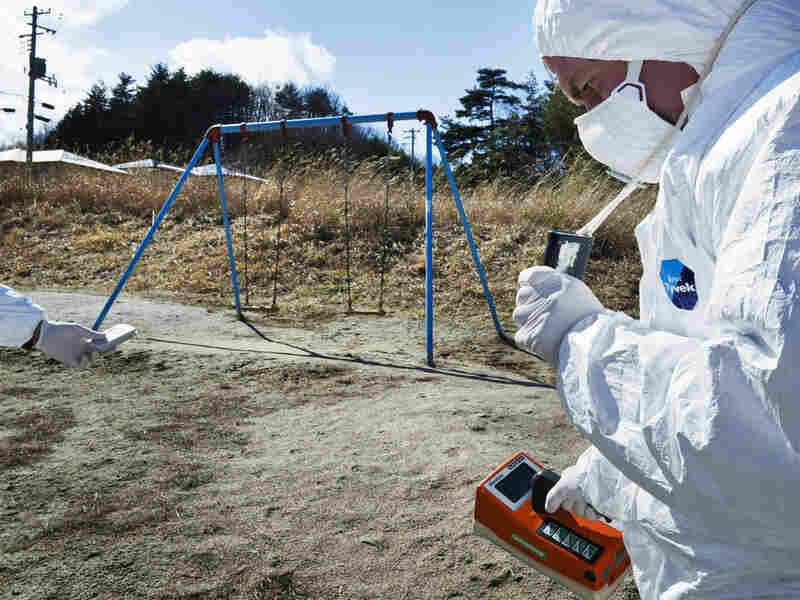 The spokesman said the radiation levels inside the 12-mile exclusion zone pose a significant threat to human health. Junko Oiwa and her son, Shigeharu, live in a rural part of Fukushima prefecture, about 20 miles from the plant. They have suitcases packed and are ready to evacuate if the situation at the nuclear complex deteriorates. But for now, they say they're comfortable and want to stay in their home. "If we are forced to evacuate from here," Shigeharu says, "this place will be unlivable. We may have to give up our home entirely." They've been able to get food by driving west, away from the plant. They say one of the big problems is the lack of gasoline in the area and long lines at the pumps when it is in stock. They both work in local factories, but the facilities are inside the 18-mile shelter-in-place zone, and they've been closed since the earthquake. Shigeharu's company could reopen soon, but at a new plant more than 150 miles away, in Yokohama. Shigeharu says all of the machines from his plant are being disassembled and shipped south. The other huge impact of the drifting radiation is on agriculture. Much of Fukushima prefecture is rural, and some officials estimate that 50 percent of residents have vegetable gardens. The government has banned the sale of scores of agricultural products produced not just here but in all of the neighboring prefectures. Yoshimi Kikuchi, working in his garden 30 miles from the nuclear plant, says he could care less about the government decree — he's comfortable eating local produce. "We are 70 years old," Kikuchi says, waving at the other retirees in the vegetable patch. "The government says it'll be 20 or 30 years before this radiation affects us. Where are we going to be in 20 or 30 years? So for young people, it's a question they have to consider. But for us, it's not much of a concern." Kikuchi is worried about the nuclear disaster unfolding on the coast, but unlike some of his neighbors, he says he has no plans to leave.